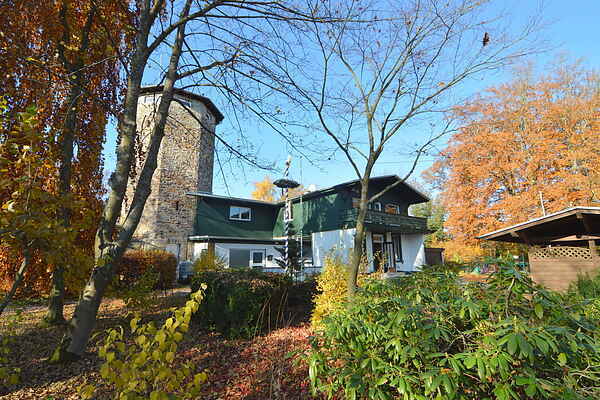 The perfect group accommodation on your very own mountain; reached via a private forest road, the Schöne Aussicht is located in the 40,000-hectare Nassau nature park high above the spa town of Bad Ems, close to Koblenz. This former hotel and restaurant can comfortably sleep up to 16 people, with bedrooms for two to six people and spacious bathrooms. Here you will find a professional-grade restaurant kitchen, a spacious dining room, a bar with a cosy woodstove we even provide the wood! and a game room with table football, Dutch shuffleboard and other entertainment. The projection room offers a mini cinema with surround sound. Outside, you will find a large fireplace/barbecue, a playground with various structures, a play chalet for the kids and a Bierstube, which is a dry and cosy spot to enjoy a drink even in winter. The grounds are enclosed so your dog is free to roam about. A Roman watch tower was reconstructed two hundred years ago and was recently converted into a luxury apartment. Enjoy the sunken bathtub in the romantic bedroom and the sitting room with a 360-degree view. All in the midst of pristine nature, with one of the most beautiful panoramas in the Rhine, Mosel and Eiffel regions. Germany's nicest mountain bike course is literally round the corner: Emser Bikepark, which offers free admission. Would you like to book the property that includes the tower? Take a look at: DE-56130-03.